General Plastics handles a project that was "Out-Of-This-World"
At General Plastics, we believe in not only providing superior products, but in assisting our clients with their special requests, no matter how “out-of-this-world” they may be. Senior Sales Engineer, Todd Roppo, received a call from an aerospace company with an unusual request: they wanted to commission a scaled model of the protoplanet, Vesta, out of our foam. “The customer was looking for some samples for a project they were working on and thought closed cell rigid foams would be a good fit,” Roppo said. Roppo, whose primary responsibility is the aerospace segment, selected the FR-4520 foam. Part of the LAST-A-FOAM® FR-4500 series, the foam was chosen because the client needed material with a smooth finish and high density to produce an exact representation of the topography of the protoplanet. The FR-4520, with its durability, definition, and fine cell structure, certainly fit the bill. Our LAST-A-FOAM® FR-4500 series are flat, stable and consistent in density, extending up to 50 pounds per cubic feet. This makes it an ideal choice for master molds, models and foundry patterns. In this instance, the higher density allowed us to define the different features of the asteroid. “If you’re trying to hold a feature or a sharp edge, or in this case the topography of the asteroid, you need something with high density to make it stand out,” Roppo said. The scope of the project wasn’t just large in terms of concept. The scale requested was 1:400,000, meaning that the final result would be around five feet in diameter. Standard sizes were not big enough to fit the customer’s request. As a solution, General Plastics manufactured two custom sized blocks of FR-4520. “This just shows that we’re willing to work with customers to satisfy their needs,” said Roppo. “We love to do every day standard production work, but we also have the in-house capability to satisfy custom requirements no matter how rigourous these requirements are. The project involved many steps outside of just the production of the model. General Plastics worked with the company from the very beginning, starting with concepts and models to ensure that what we delivered was a perfectly scaled replica of Vesta. 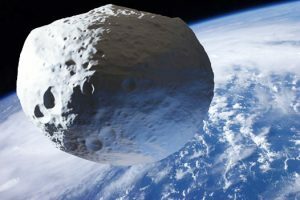 “The actual asteroid was scanned through satellite to get geometry and surface topography to emulate the actual asteroid,” Roppo said. It was from that scanned image that General Plastics created the model. General Plastics was also responsible for the final touches, from custom pours to machining, to bonding and painting. As part of our quality assurance, a customer crate was built in order to properly support and protect the model during shipping. “I want customers to know that if you’re having trouble finding what you need, give us a call. We’re always willing to look at special projects and always want to meet and exceed expectations,” Roppo said.